Hello, and thank you for visiting the Omni Blog. It's come to our attention that there is some confusion about us and our products, and we wanted to take the opportunity to provide clarification. When you write us and tell us your “Omni” won't work, it makes us cry like little girls who just finished “Bridge to Terabithia” for the first time. It is true that all of our product names do involve the word Omni. You know, it's kind of our “thing”. We also greatly enjoy InterCapping words together. It gets AnnoyingSometimes, but that's just the way WeRoll. However, without the product name that follows the “Omni” part, for all we know, you're talking about O.M.N.I, the Opportunities for Micronutrient Interventions. And we totally can't help you with that. No, we don't make that OCR scanning thing. Some of you don't believe us, and you get a little irritated, especially during Macworld when it's 4 PM on the last day of the show and you could swear we make that OCR software, but I promise: we don't. 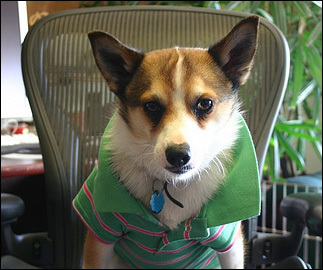 We can neither confirm nor deny dressing this dog in a shirt and taking his photo. It doesn't seem like something we would do, especially during business hours. 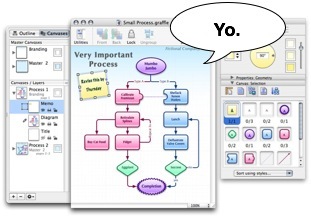 It's OmniGraffle. Graffle. OmniGraffle. Not OmniGraph. Not OmniGraffi. Not OmniGraffo. And under no circumstances whatsoever is it OmniGIRAFFE. Yes, it's a weird name, but if you can say “Shrimp chips” three times fast, then by golly you can say “OmniGraffle”.